WORTHING Raiders Rugby Club’s three-game winning streak in the National 2 South was ended by newly-promoted Redingensians on Saturday. Raiders would have gone into their fifth game of the new season full of confidence following successive triumphs over Old Elthamians, Barnes and Cornish All Blacks. Spirits would have also been lifted for the travelling side as their latest opponents had suffered four defeats in as many league matches so far this season. However, the result was not to go with the form book as Redingensians produced a fine display as Raiders fell to just a second league loss. The home side made a lively start and were on the front foot straight from the first whistle. Redingensians should have found themsleves ahead after just two minutes but they failed to kick over a penalty as the scores remained level. Raiders’ backline was under consistent pressure and the home side were awarded a five metre penalty on nine minutes following a disallowed try. They opted for the scrum and Worthing found themselves in disarray at the back, resulting in a penalty try being converted by William Hopkins as Redingensians went ahead. Raiders responded well to falling behind, though, and thought they had clawed their way back into the clash a minute later. The ball was driven upfield through fine work from both backs and forwards before Worthing went over in the corner only for the referee to adjudge it was held up. Kieron Dawson’s men did register their first points of the clash soon after, when being awarded a penalty which was converted by Sean O’Hagan on 23 minutes. With just four points in it Worthing would have had high hopes of getting back in the contest. But sloppy play from Raiders just before the break saw Reuben Norville intercept a pass and run 40 yards to touch down. Hopkins made it two conversions from two to give his side a 14-3 lead at the interval. Raiders got off to the worst possible start in the second half after falling further behind less than a minute in. James Foxley collected the ball on Worthing’s ten-metre line before sprinting forward and finding Aaron Hopkins who went under the posts. William Hopkins continued his fine kicking and made sure his side opened up an 18-point lead. It could well have got worse for Raiders on 42 minutes but Hopkins kicked wide a penalty as it remained 21-3. Redingensians remained in control for much of the second half and thought they had extended their lead further on two occasions. First, a score was disallowed for a forward pass, while a second was chalked off for a hold up. With nine minutes left, Samir Krarbouch dodged a couple of challenges and went over to ensure the win for his side. Hopkins converted yet again as his side opened up a 28-3 advantage. Worthing scored a consolation try with five minutes left through Dan Sargent, O’Hagan converting. But any hopes of a late comeback were wide of the mark as Raiders slipped to their second loss of the campaign. 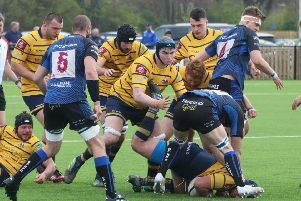 Worthing host Southend Saxons in the league on Saturday. RAIDERS: Storer, Brooks-Watson, Sargent, Barlow, Heward, Lake, Whittall; White, Peach, O’Hagan, Nielsen, Leeming, Greenwood, Wilcockson, McLean. Subs: Gibson, Perkins, Margetson, Hewick, Farnes.